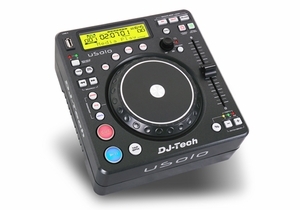 The DJ Tech uSolo media player lets you play your digital files without a laptop. There are two USB ports to connect thumb drives, external hard drives up to 250GB and iPods. * Tracks load instantly once the USB media is connected. No lengthy indexing process or database creation. Just plug and play. uSolo packs a huge number of controls and functions for such a compact player: Aluminum jog wheel with vinyl mode, 5 DSP effects,100% pitch range, tempo lock, auto BPM counter, backit LCD display, and much more. *Due to Apple limitations, the iPod� iTouch, iPhone & Mac formatted Classics, iNano are not compatible.